Dr. Anjana Nair graduated in MBBS from Seth G.S. Medical College and KEM hospital, Mumbai. She completed her MD (Medicine) from Indira Gandhi Medical College and Mayo hospital in 1995. Later she joined Grant Medical College and Sir J.J. group of hospitals, Mumbai to obtain DM in cardiology. She submitted her thesis on “Clinical and Echocardiographic study of Infective endocarditis” and “Profile of Coronary artery diseases in Indian woman”. Dr. Anjana is member of prestigious Cardiological Society of India, Association of Physicians of India and Indian Academy of Electrocardiography. 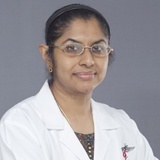 Dr. Anjana Nair has more than 20 years in working ICCU, ward management, stress testing, Holter monitoring, Echocardiography as well as 24 hour ambulatory blood pressure monitoring. Before joining in NMC hospitals, she was associated with Middle East Medical Center in Riyadh, Saudi Arabia.